After spending a couple evenings making projects for other people I decided to make myself a new wallet for the weekend! My everyday wallet is huge because it holds my checkbook and about 100000 credit cards. I love it though! Since I don't want to carry every card I have when I go out, I made myself a smaller one. 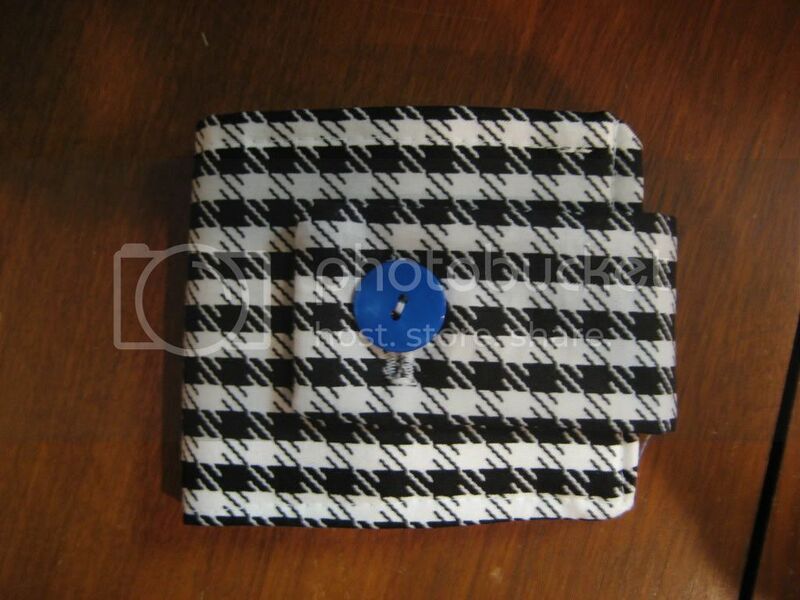 I've been saving this houndstooth to make something for my sister, but then I thought it would be perfect for a wallet. I still have plenty left for her. I don't like wallets that are too thin, so I'm glad it has some substance. Even though it has hardly any money in it! For my first wallet it's not bad, but next time I think I'll estimate my measurements better. There's hardly any room for my cards on the right hand side, I really had to shove them in. And I still tried to get all my cards in! I finally decided I don't really need my Giant Eagle card or my corporate purchasing card while I'm on vacation. Ok here's a tutorial for making my bifold wallet. 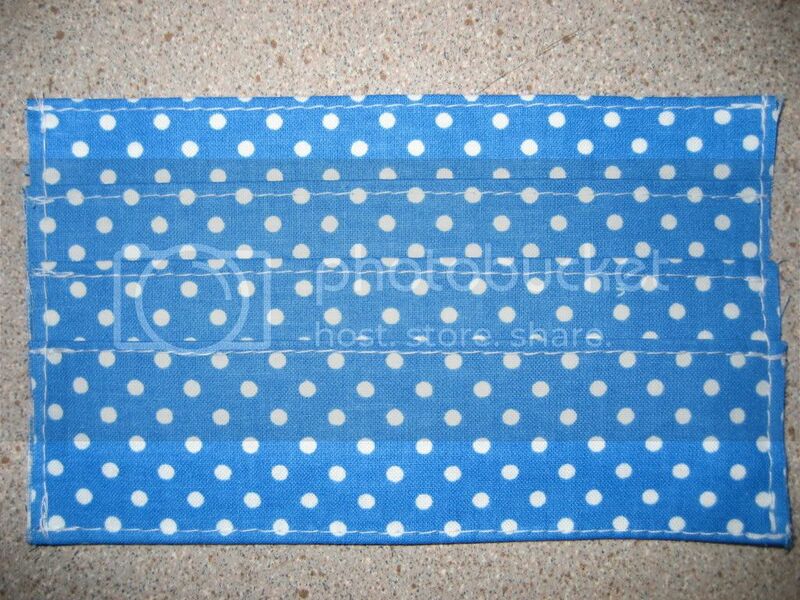 The main fabric can be cotton, but if you want it to be a little sturdier you should use canvas or home dec fabric. The inside should be a thin cotton. 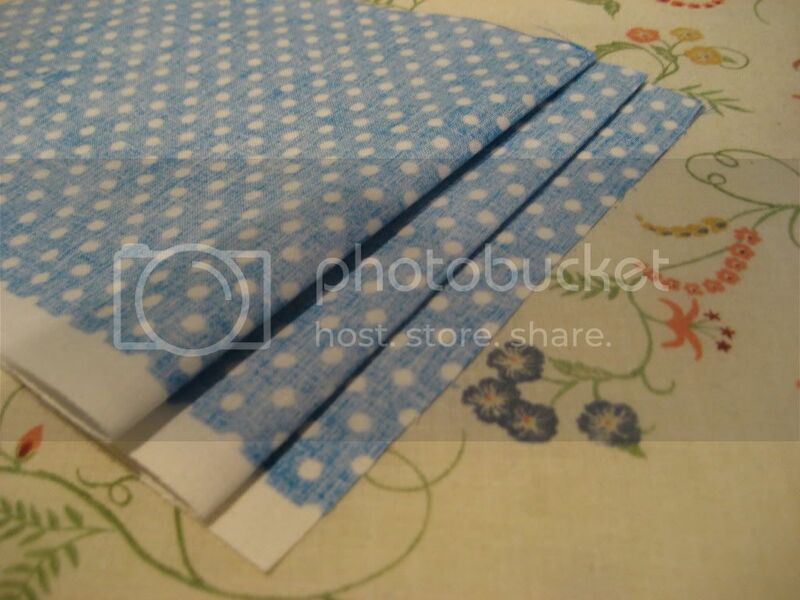 I recommend heavy duty interfacing, definitely no lighter if you're using cotton for the outside fabric. Since the thread will show through to the outside you might want to match it, unless if your stitching is neat then contrasting thread would look great. You also need a button or snap. The pink button is 3/4" and the blue is 1". Also, you should have a good iron. You and your iron will become very good friends with this wallet. Step 1: Iron all your fabric. Take one C piece and press 5/8" seams all around toward the wrong side. This will be the piece that your pockets are mounted on, I'll call it the backing piece. For the other two C pieces, press a 5/8" seam on one long side only towards the wrong side. These will be the cash pocket pieces. Step 2: Next we will make the cash pocket. Take the backing piece C and attach it to another C piece wrong sides facing, with the pressed edge at the top. Sew once along that long edge. Line up the other C piece with the pocket piece that was already attached, right sides facing. Sew those pieces together right sides facing at the sides and bottom, leaving the top open to insert the cash! Make sure the seam does not show under the backing piece. Trim the edges so the entire pocket is underneath that piece. 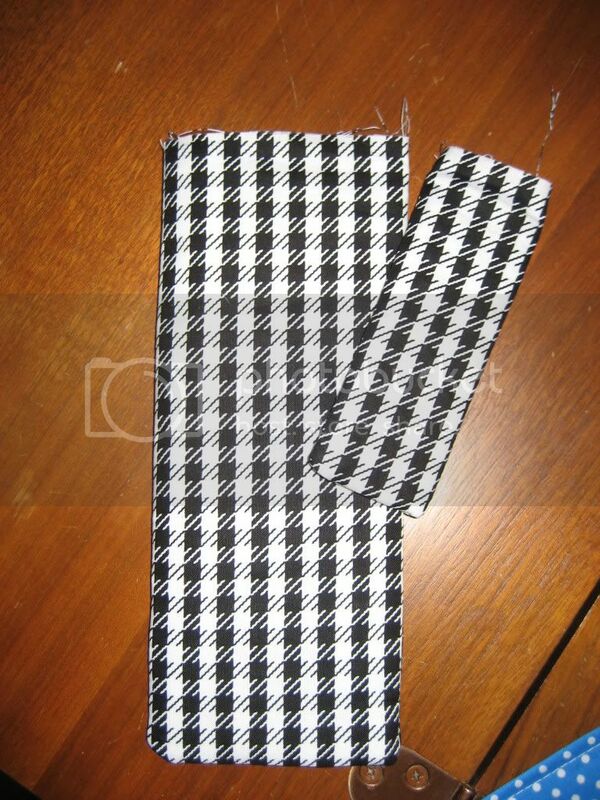 Step 3: We will now make the credit card pockets. This is where you and your iron become BFFs, there is a lot of pressing involved. I hope these instruction aren't too confusing, it might help if you've done this kind of pocket before. Lay one D piece with the wrong side up and fold over 2" at one end, press. Flip over and pull the long side down until 0.5" shows at the raw edge, press fold. You have just made a credit card pocket 1.5" deep. Keep alternating 2" and 1.5" folds until you have 3 pockets. I didn't do it right the first time, so I just flipped and folded until I got it right. Just remember that your pockets are 1.5" deep and 0.5" apart, so the right side folds should be 2" tall and wrong side folds should be 1.5" tall. 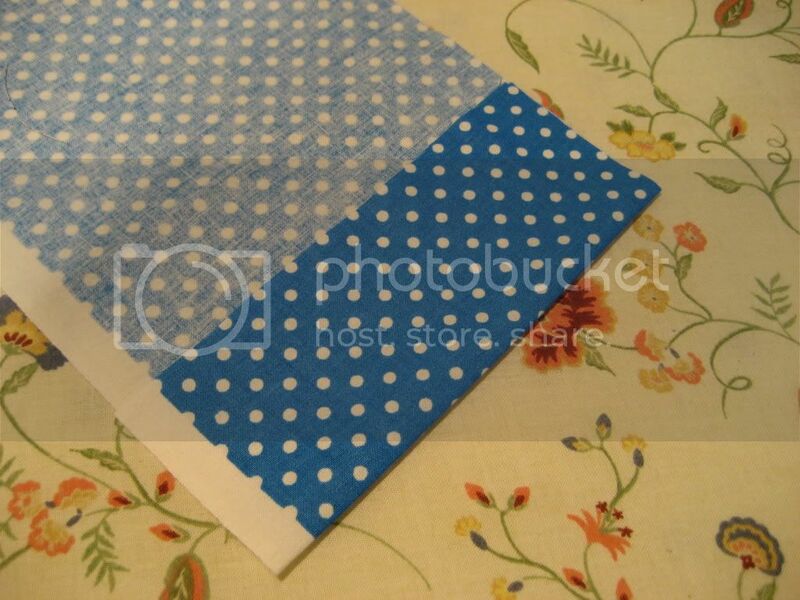 Fold over and press the raw edges 0.5" at the top and bottom towards the back, then topstitch them. I recommend topstitching the pockets too. Sew a narrow seam at each end to keep the pockets together. Repeat for other pocket. 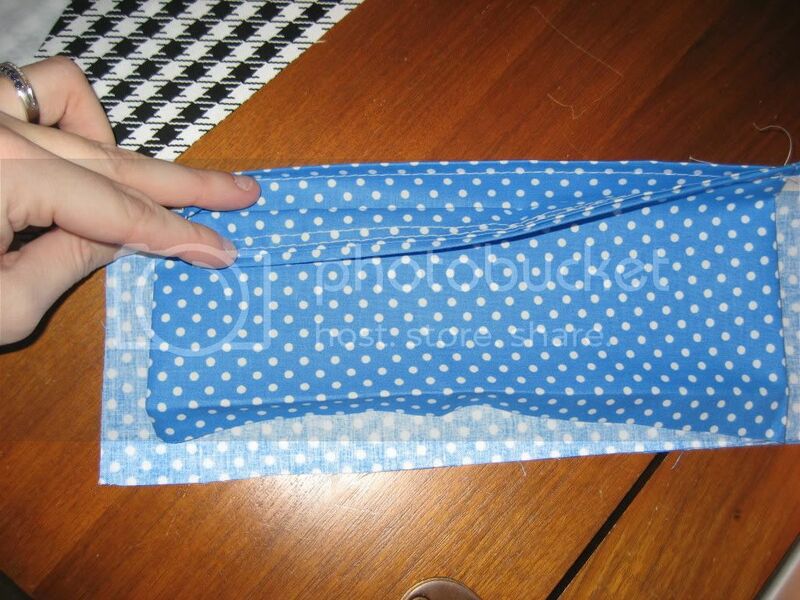 Fold and press the raw side edges of the pockets you just made towards the back. Before you stitch, make sure they fit on the backing piece C with at least 0.5" between so you can fold the wallet, more is better. When you're happy, stitch the sides and trim the seams to reduce bulk. Step 4: Next is the outside of the wallet. Put the E interfacing pieces on the wrong sides of the A pieces, then sew everything together with A pieces right sides facing. I used a 5/8" seam. Leave one short side open to turn. Do the same with the B and F pieces, this is the flap for the button/snap. If you're using a snap and don't want it to show on the flap, attach it before you sew the B pieces. 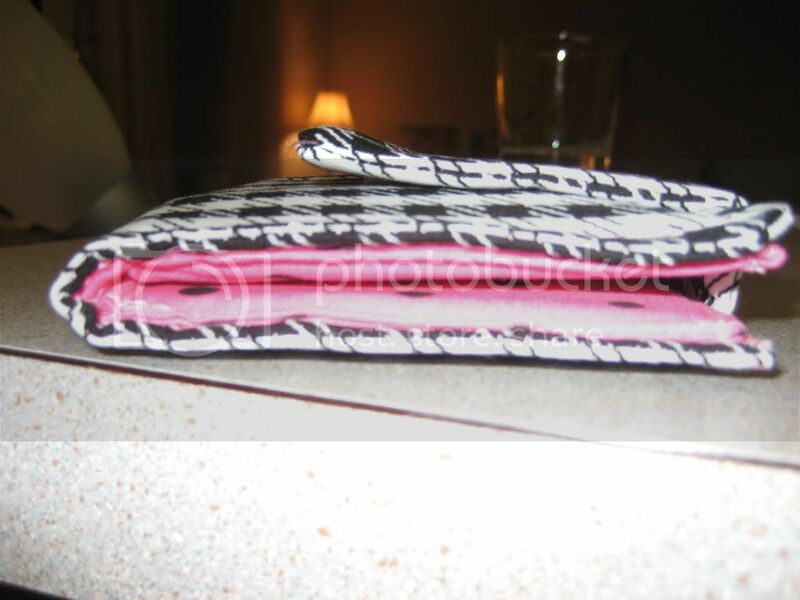 Put the raw edge of the flap inside the wallet, fold raw edge over and pin. Fold the wallet and decide where you want to place the button or snap, I did mine in the center. Attach your button or snap pieces (no need to trim threads!) and make your buttonhole in the flap if necessary. Step 5: Putting it all together! 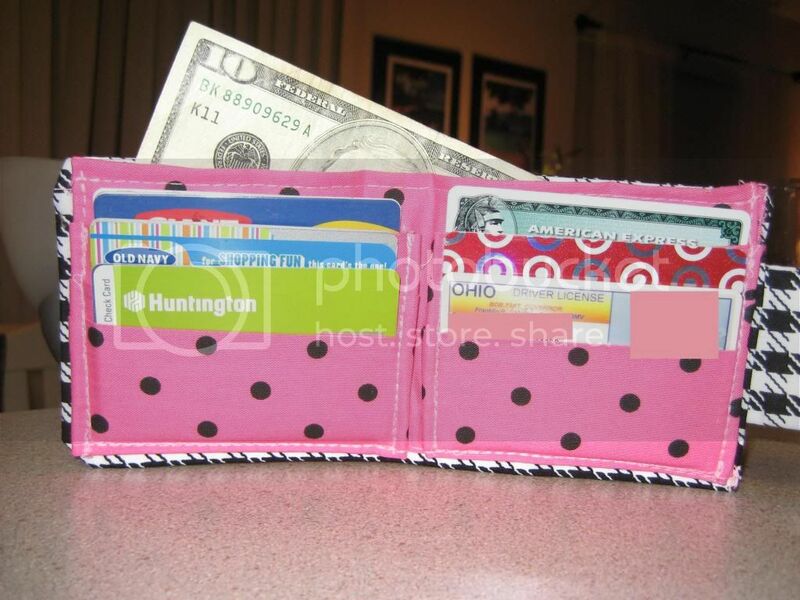 Place the credit card pockets on the backing piece and stitch them on along the center edges only. Make sure to move the cash pocket out of the way. Center this whole piece on the wrong side of the wallet, covering up your button threads. Stitch all around, making sure it's even the whole way because your stitches show through. If you're overlapping stitches try to line that up too (I call it deadheading). 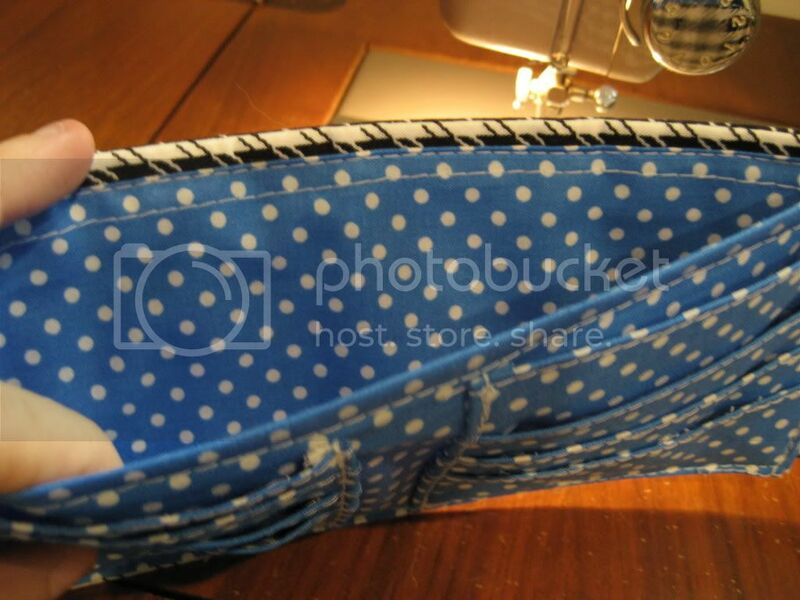 When you get to the cash pocket, just sew the bottom flap down or else you'll seal the pocket. Now you're done! Enjoy your wallet! Re: My first wallet! 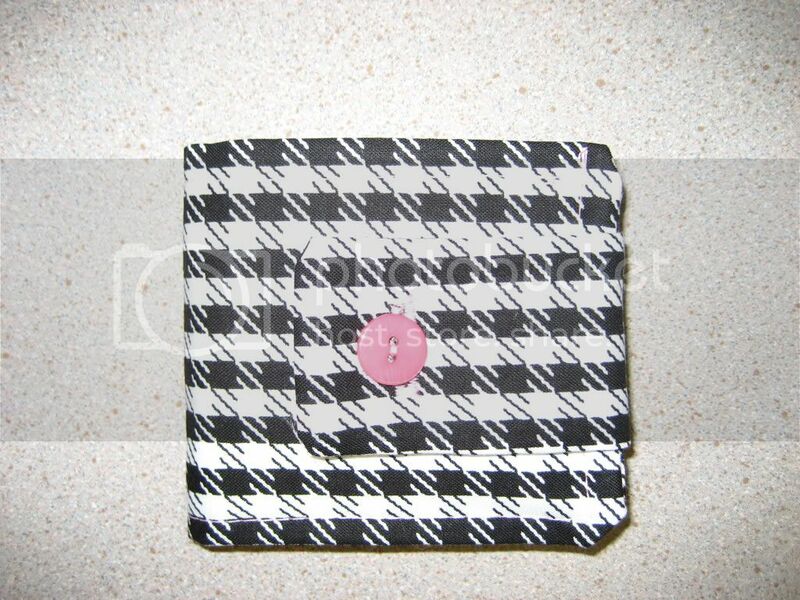 Houndstooth and pink! this is cute...how'd u do this? I love the color combination and fabrics you chose! Awesome first wallet, I want to try to make one! Love the fabrics! did you use any craftser tutorial??? 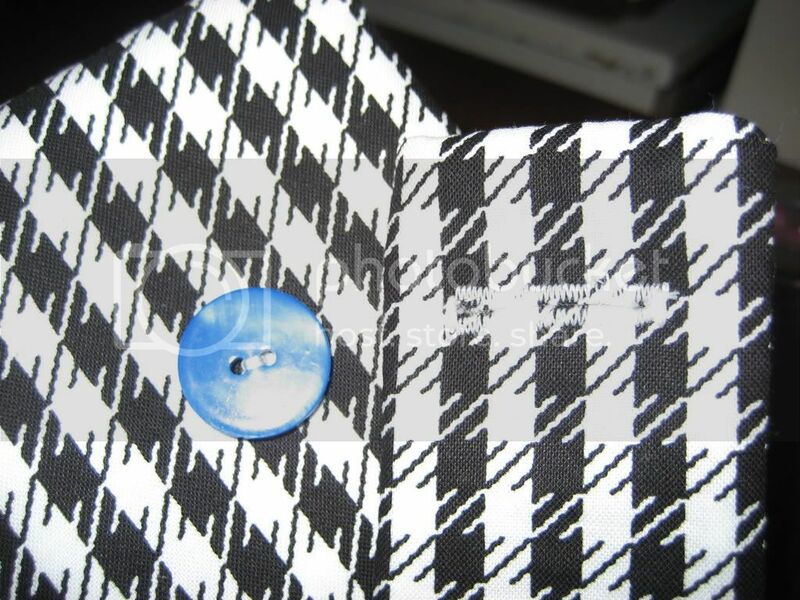 Love the combo of houdstooth and polkas! Nope I just made it up as I went. I could do a tutorial if you want, I actually plan on making another one for my sister. I love these fabrics too, actually they sort of came together. They were on the same rack at Hobby Lobby so I just had to get them both! very cute. I love the colors. Great job. yea! tute would be so cool!